Many of our current and former clients work in the service industry–including servers, wait staff, bartenders, delivery drivers, barbers, stylists, massage therapists, and estheticians–and rely on the tips they earn in order to earn a living wage. We have developed a sub-focus in tipping and gratuity law. In Minnesota, tips and gratuities are the sole property of the employee who received the tip, a right guaranteed under the Minnesota Fair Labor Standards Act (“MFLSA”). Taking a Tip Credit. It is always illegal for Minnesota employers to count tips towards their minimum wage obligations, a practice known as taking a “tip credit.” Employers may not avoid their minimum wage obligations by taking tips away from the employee who earned the tip. Under the MFLSA, employers must pay their employees the minimum wage, plus any tips the employee earns on top of minimum wages. Tip Pooling, Tip Sharing, and Tipping Out. 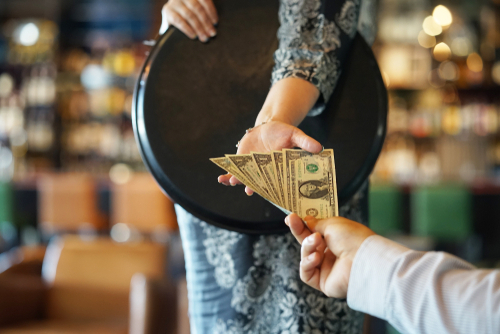 It is generally illegal for Minnesota employers to require service employees to pool their tips together for redistribution, share tips with other employees, or “tip out” indirect service employees such as kitchen staff, runners, and bussers. Participating in Tip Pooling and Tip Sharing Schemes. It is generally illegal for Minnesota employers to participate in tip pooling and tip sharing schemes, or to coerce employees into participating in tip pooling and tip sharing schemes. In almost all cases, an employee’s decision to share tips must be completely voluntary, and free from employer participation or coercion. Retaliating Against Employees Who Refuse to Participate in Tip Pooling and Tip Sharing. It is always illegal for Minnesota employers to retaliate against employees who exercise rights under the MFLSA, including the right to keep their tips. Contact the Law Office of Joshua R. Williams if you believe that your employer has violated your right to retain your tips. If we believe that your employer has violated your legal rights we will negotiate compensation or sue your employer and represent you in court, if necessary. We often bring these kinds of cases as class actions, where multiple people who have had their rights violated in the same way join together to bring legal claims in a single lawsuit. Our clients worked at a restaurant that required its servers and bartenders, including our clients, to “tip out” 20% of their earned tips to indirect service providers such as bussers and cooks. In other words, the restaurant passed the cost of paying its kitchen staff a living wage onto the servers and bartenders. We brought a class action lawsuit on behalf of our clients and their similarly situated coworkers, and recovered the thousands of dollars in tips that the restaurant forced them to turn over, the exact amount which is confidential.